Stop, in the name of traffic? 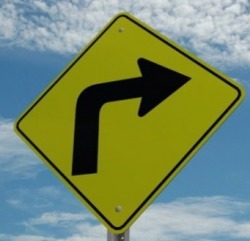 Stopping and turning might not seem to be a big deal in the driving world but, in fact they are. Think back to the last trip you took with your family. How many times do you remember making a sudden stop or turn during your trip? Like many drivers out there, they can't recall how many times they have had to stop or turn. Also, can you recall being in a car with another driver who seemed a little tense or unsure during these important tasks of driving? Below are some helpful hints to ensure a safe trip. 1. Before entering the stop street, look for pedestrains on your right and left sides (your right blilnker should be on at least 100 ft ahead of time). 2. If clear, continue to drive up to the stop sign and stop at the sign. Check again for pedestrians and traffic. 3. Once you are clear, now pull up to the white line and check one last time for pedestrians and traffic on your right and left sides. 4. Slowly hit the gas while executing the right turn. 5. Continue with the flow of traffic. 1. Before entering the stop street, look for pedestrains on your right and left sides (your left blilnker should be on at least 100 ft ahead of time). 4. Slowly hit the gas while executing the left turn. At one point or another, a persons blinker(s) may burn out. No one knows exactly when they will go, but everyone should be prepared to use the next best thing...hand signals. 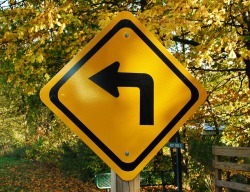 ...when using hand signals, the same rules apply as if your turn signals were working. 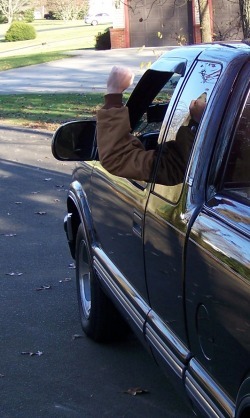 Be sure to use the hand signal at least 100 ft ahead of time to ensure the drivers around you of your destination. 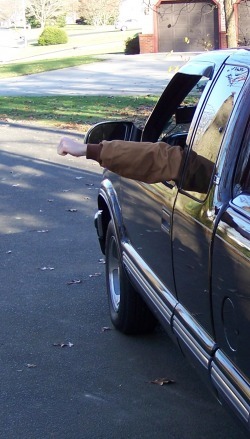 Also, be sure to emphasize the fist and angle of your arm so it will not look like you are throwing something out the window (right hand turn) or holding onto the window visor/ hanging your arm down for comfort (left turn and stop).